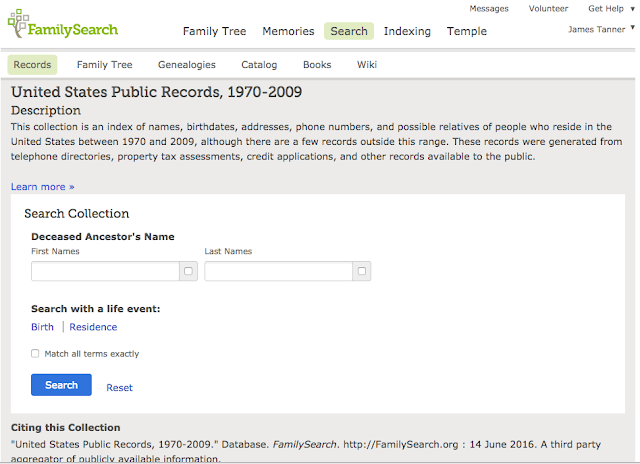 Is Genealogy Public or Private or Both? 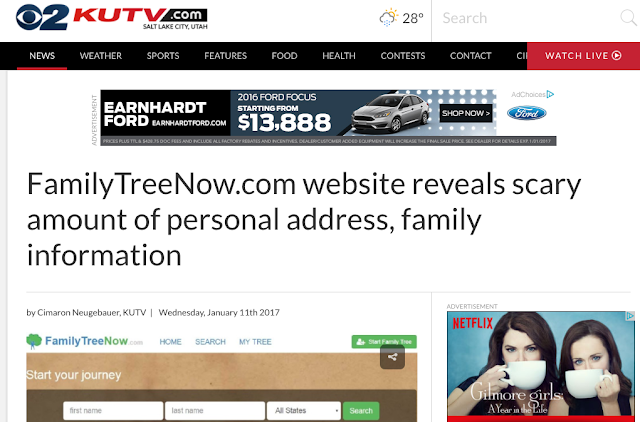 A major article in the Deseret News National Edition for January 29, 2017 and previous articles such as the one shown above from KSL.com with the title of "Free genealogy website generates privacy concerns," continues to circulate through the online community. 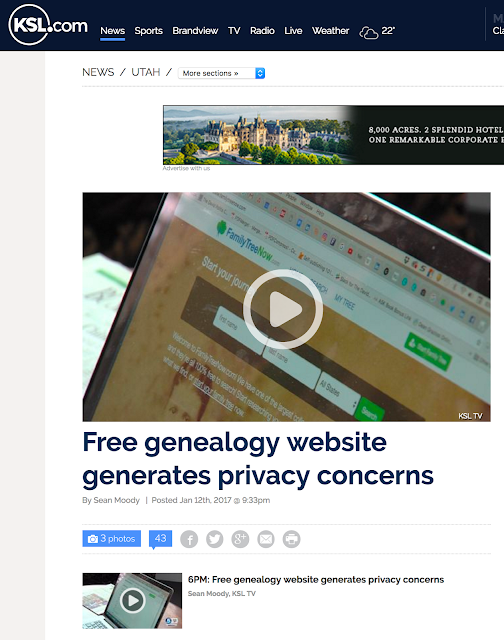 The much longer January 29, 2017 article in the Deseret News National Edition with the slightly changed, misleading, and inaccurate title of "Free genealogy websites may compromise privacy," is apparently not available online. Our mission is to create the best free genealogy site in the world. 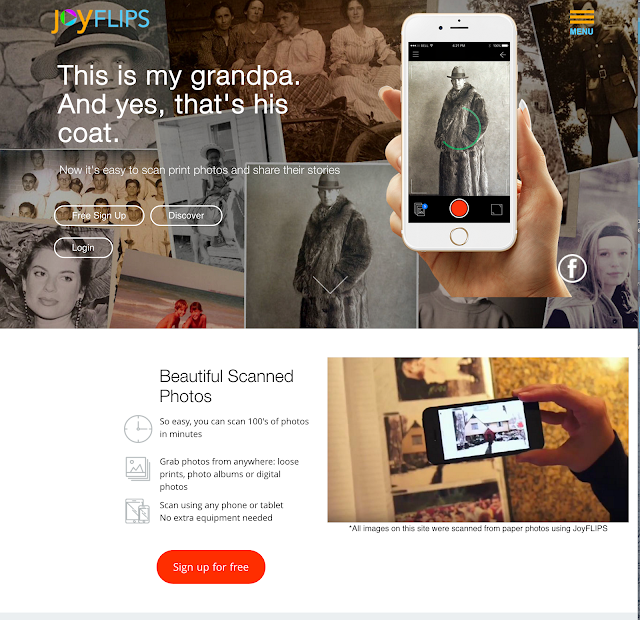 We want it to be super easy to use for new users yet powerful for experienced genealogists. We're working really hard to improve the site and add great new features. If you have any suggestions please let us know your thoughts so we can improve! 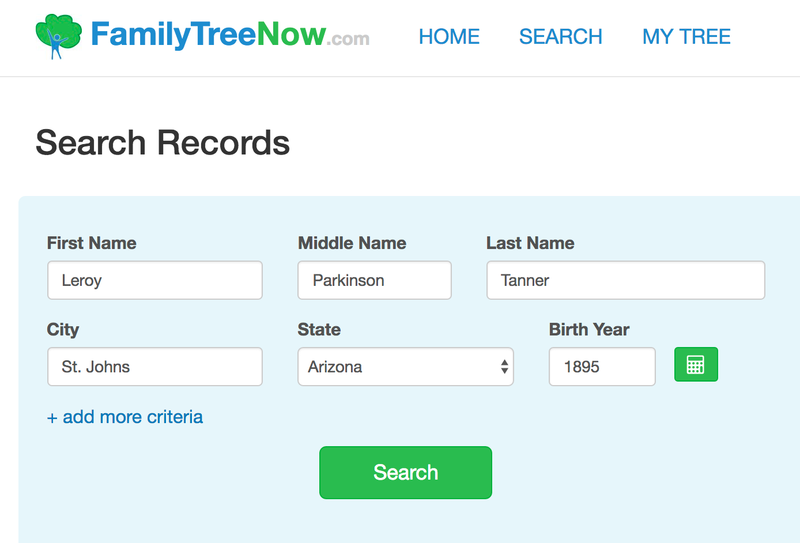 FamilyTreeNow.com was launched in 2014 by some technology veterans who like taking services that typically cost money and making them free so everyone can use them. We have great offices in Roseville, CA where we draw up new features on our giant whiteboard wall and generally try to have a good time while also working really hard. 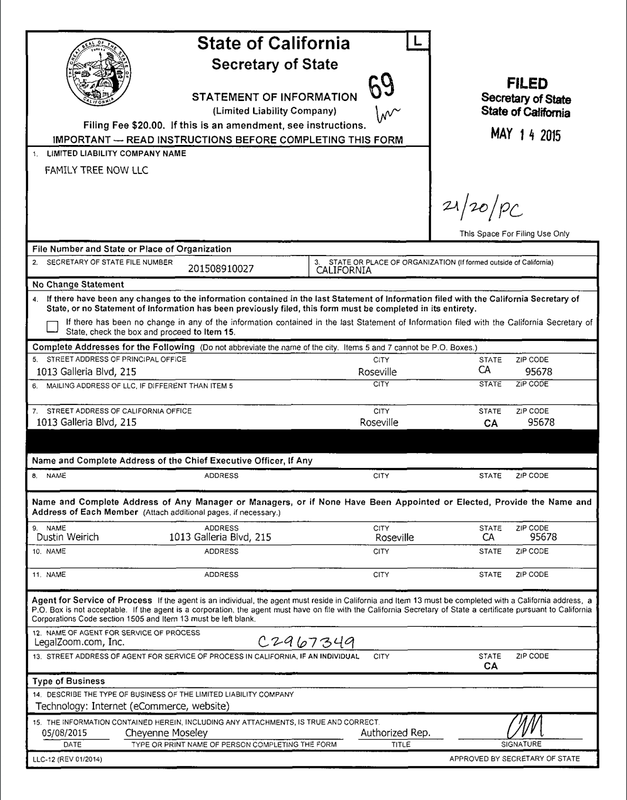 The site apparently is the brainchild of Dustin Weirich, who is listed in California secretary of state records as its manager from a May 2015 filing. A LinkedIn listing for a Dustin Weirich from the Sacramento area does not mention the site, but says he is the former founder of the Internet dating site DateHookup.com and sold it in 2012 to Match.com. It also lists him as CEO and founder of a firm called Blade Fire Studios that shares the same Roseville address as FamilyTreeNow.com. Weirich’s page also lists his time studying computer science at Sacramento State from 2008-2009. “Got bored, left,” his page explains. The danger here for genealogists is to generalize their concern about privacy and dismiss all online family trees as "dangerous." In fact, this is not a speculative issue, I frequently talk to people whose main reason for not using an online family tree is based on privacy concerns. These privacy concerns arise, in most part, as a result of years of extraordinarily exaggerated claims concerning the incidence of personal identity theft in the United States made by companies that are selling "identity theft protection" schemes. As I have pointed out in many previous posts, the statistics for "identity theft" include complaints for items such as lost and stolen credit cards and do not focus on arrests or convictions. If the website is actually searching the records listed, it would have easily found this name. I would suggest that this site be simply ignored. But I would also suggest that those of you who are somehow bothered by the amount of public record information online, become educated about the issues and legislate for changes. Genealogists have been targeted with specialty scanning devices for the past few years. Over that same time period, as technology has changed, smartphones equipped with cameras have become ubiquitous. Even as a professional photographer, I now partially rely on my iPhone 7 Plus for some of the photo opportunities that I have. Some of the recent photos on my photo blog, WalkingArizona, have been taken with my iPhone. There are several scanning apps for both iOS and Android devices, but the free JoyFlips.com app is one of the first to target the family history and genealogy market. JoyFlips.com is listed as one of the newer apps in the FamilySearch.org App Gallery. The app is listed as both reading and updating information in your FamilySearch account and allows voice tagging. 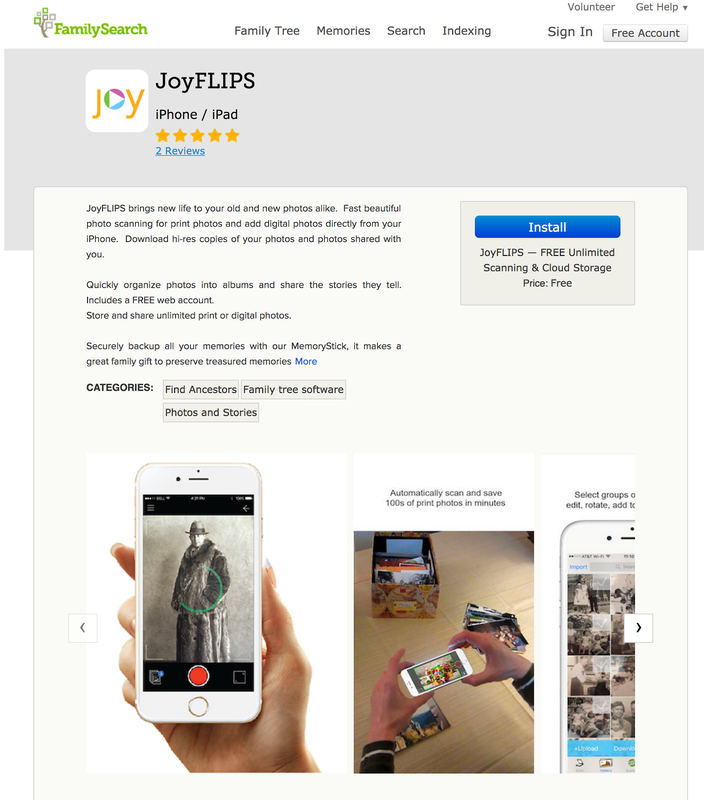 JoyFlips.com also advertises free unlimited scanning and cloud storage. So far, GenSoftReviews.com lists the app but there are no reviews as yet, however, both the reviews on the FamilySearch.org App Gallery are positive. My most recent post on the subject of scanning with a smartphone is "Using a Smartphone to Scan Documents" posted on December 21, 2016. I will update that post in the very near future and use photos as an example. I would say this about using a smartphone to scan photos or documents. 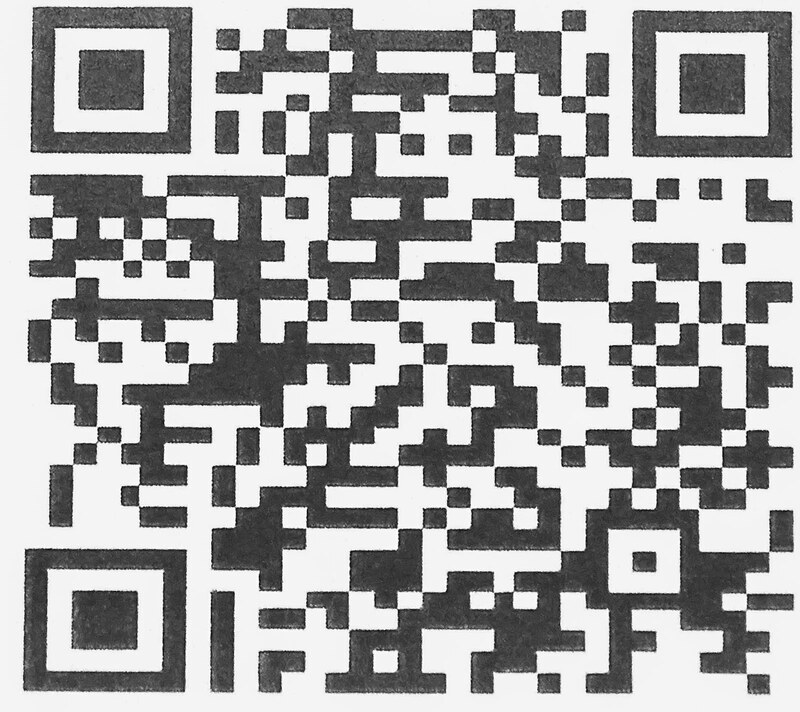 It is certainly better than losing the opportunity to scan the photos or documents if all you have is your smartphone. There is a saying among photographers, "The best camera is the one you have with you when you need to take a photo." What do John Wayne, Bob Dylan and Charles Jarvis have in common? Each of the individuals in the title of this blog changed their name. John Wayne was born Marion Mitchell Morrison. Bob Dylan was born Robert Allen Zimmerman and my Great-Great-Grandfather, Charles Jarvis was born Charles Godfrey DeFriez. Name changes are a big deal with genealogical researchers mainly because of the difficulty of determining, in many cases, the identity of the changed-name person's parents. First, I need to dispel the standard myth that the U.S. Government changed people's names upon their arrival in America at Ellis Island. This was simply not the case. Spelling is one of the main issues, however. Some immigrants, beginning with the first wave in the 1600s could not read or write and had no idea how to "spell" their own names. In addition, many immigrants spoke languages other than English and some of those languages have different alphabet systems than the one commonly used for English. When one of my ancestors came to America, he is recorded with the name of Overson. In Denmark, his name was Oveson, without an "r." It is commonly assumed that because he came from Denmark, his name "should have been" Ovesen. But I find it recorded as Oveson before he arrived in America. Some researchers make decisions about relationships based merely on differences in spelling and that is a big mistake. But back to the issue of actual name changes. There are likely a multitude of reasons why someone would change their name. I used to sit in court a lot as an attorney and watch the courts hear Petitions for a Name Change. The reasons given were usually trivial and were often based on family disputes and fights. In the United States, it is common for divorced women to revert to their maiden name. But there are exceptions when children are involved in the divorce. Some mothers do not want to have a different surname than their children. In one case I am aware of, the divorced woman reverted back to her first husband's surname rather than her own maiden name. In 1615, English courts began to send convicts to the colonies as a way of alleviating England's large criminal population. This practice was unpopular in the colonies and by 1697 colonial ports refused to accept convict ships. In response, Parliament passed the Transportation Act of 1718 to create a more systematic way to export convicts. Instead of relying on merchants to make arrangements on their own to ship felons to the colonies, the British government subsidized the shipment of convicts through a network of merchants, giving a contract for the service to one individual at a time. Between 1700 and 1775, approximately 52,200 convicts sailed for the colonies, more than 20,000 of them to Virginia. Most of these convicts landed and were settled along the Potomac and Rappahannock rivers. Although many were unskilled and thus put to work in agriculture, particularly tobacco production, others with skills were sold to tradesmen, shipbuilders, and iron manufacturers, and for other similar occupations. Convict laborers could be purchased for a lower price than indentured white or enslaved African laborers, and because they already existed outside society's rules, they could be more easily exploited. Nevertheless, Virginia tried repeatedly to pass laws to prevent England from sending convicts, though those laws were overturned by the Crown. At the beginning of the American Revolution (1775–1783), colonial ports virtually ceased accepting convict ships. By 1776, when the last boatload of convicts arrived on the James River, many of the convicts had served their seven-to-fourteen-year terms and returned to Great Britain, while others had become honest citizens and blended into Virginia's colonial economy. See Salmon, Emily Jones. "Convict Labor during the Colonial Period." Encyclopedia Virginia. Virginia Foundation for the Humanities, 27 Oct. 2015. Web. 29 Jan. 2017. Many of these people likely changed their names. Because of these numbers, the possibility of discovering a convict in your early colonial ancestry is extremely good. Of course, it is also certain that some of those who came to America did so to escape arrest and prosecution in England as well as the rest of Europe. Additionally, many immigrants changed their names to Americanize the spelling or to translate the name from another language into English. 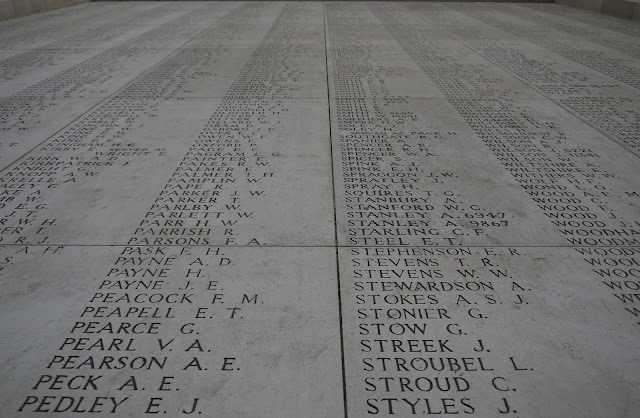 When confronted with a suspected name change, the genealogist should begin to do research in depth and include research into the family and extended family of the person whose name seems to change. It is also possible that descendency research from the immigrant will disclose the original name. Since 1897, the General Society of Mayflower Descendants (Mayflower Society) has been conducting lineage research on the pilgrims and their descendants. Despite this mammoth effort towards accurate historical research, it is not uncommon for careless genealogists to adopt bogus pedigrees for their Mayflower ancestors. The parents of nearly all of the Mayflower passengers have never been identified and if you think you are a Mayflower descendant, you should be very familiar with the "Silver Books" published by the Mayflower Society. The topic of name changes is an interesting and challenging one. Sometimes, the researcher just has to admit defeat and move on to another ancestor. There are end of line situations that cannot be solved. I spent a pleasant afternoon helping a friend do some very complicated research concerning his Welsh ancestors. We ended up looking at three large rolls of microfilm that turned out to be all in Welsh (Cymraeg or y Gymraeg). Needless to say, my friend was discouraged. Of course, I just looked at the situation as normal. Another good friend succumbed to the dangers of snow and ice and fell on his way walking to the BYU Family History Library. Unfortunately, he will be laid up for a month or so recovering from the fall. My friends in Mesa, Arizona would point at this incident as a reason to move from the Frozen North to the lovely dessert. I would simply note that I have had any number of my friends in Mesa suffer from falls from even more mundane things than ice and snow. In fact, I had two or more rather spectacular falls walking from my car to my office on sunny, very dry days. These two experiences actually have a lot in common. Life presents itself as a series of events. Not all of them are unfortunate (despite the perspective of Lemony Snicket) but many of things that happen to us seem to directly affect our desire and/or our ability to find our ancestors. From my own perspective, I try to see all these obstacles as stones in the path to be stepped over rather than using them as reasons to give up and to quit trying. Genealogy has its triumphs, but it also has its days, weeks, months and sometimes years of hard work and frustration. Finding out that your ancestors spoke a language you do not know and probably do not want to learn is just one of the more obvious issues. Since many of us are at a certain age when just getting up and moving around can be a challenge, sitting all day in front of a computer or microfilm reader hour after hour does not have the same attraction it did just a few short years ago. Most of us are also wrapped up in family, work and leisure activities that do not include a lot of genealogical research. I have any number of friends and acquaintances that do not think that sitting in a library all day is an attractive activity. So, being caught between the physical limitations and surrounded by alternative activity choices has a strong influence on the amount of time most are willing to dedicate to genealogy. Then why do some of us elect to break the mold and spend an extraordinary amount of time doing genealogical research and closely related activities? Good question. Some of us claim a religious motivation. Some claim benefits of personal insight from learning about their ancestors. Beyond these justifications, there are those of us who feel a compulsion. Being in the latter capacity, I don't really have to get into deep introspection; I just do genealogy all day and sometimes most of the night. This is one of my constant pleas: that we, as genealogists, somehow connect what we research to reality. Let's get real, as they say, and spend some time thinking about the implications of what we enter in our family trees. Adding family members based on the names of the people without verifying that dates and places match the other family members. Although it is true and common that people move from one place to another, as we go back in time, we have to take into account the conditions that existed at the time of the events we are recording. For example, in England in the 1700s, absent so very specific circumstances, we cannot expect that a mother would have had children in widely separated locations such as counties that are more than a hundred miles apart. Assigning dates to family members that are not chronologically or physically possible, such as a child born before a parent or a baby born after the death of a mother. Adding in parts to names that do not appear in any contemporaneous records. In my own family history, I have several ancestors who have been given Roman numeral designations that do not appear in any contemporaneous record, i.e. Garrard Morgan III. I also find ancestors with middle given names that do not appear in any contemporaneous record. The list could go on and on, but I think three examples is enough to illustrate the issue. If we insert a date of birth for a child and fail to note that the date is after the date we have provided for the mother's death, the implication is that either one or both of the dates are wrong or that we have added a child that does not belong in the family. A program such as the FamilySearch.org Family Tree will sometimes find date inconsistency errors and mark them as unacceptable. But many programs do not check date and place inconsistencies and so even typographical errors often remain undetected and then perpetrated when the entries in the family tree are copied by a careless researcher. So, my statement about thinking about the implications of what we are entering into our family trees involves analyzing the data for consistency and reality. 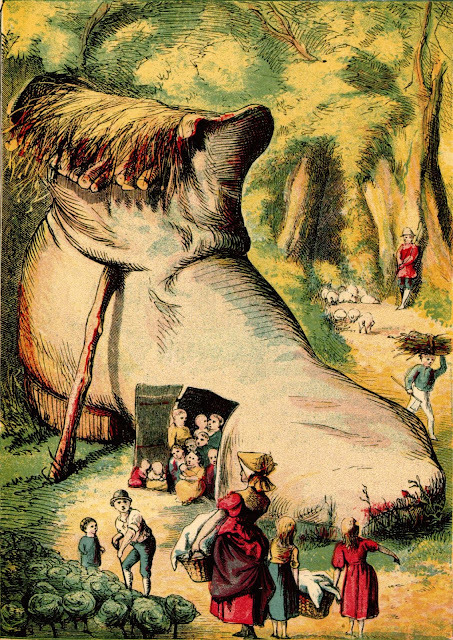 The genealogical significance of this old nursery rhyme should be apparent. I often find family trees with families containing far more children that could reasonably be expected. 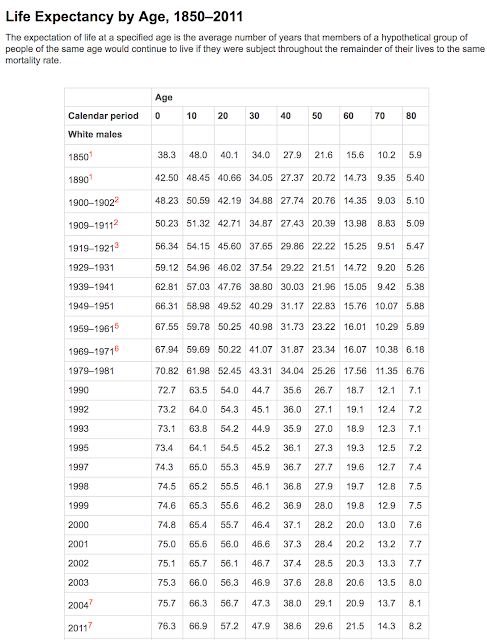 At this point, I would usually quote some authority or statistic on the most children on record by one mother, but in this case the greatest officially recorded number of children born to one mother is 69, to the wife of Feodor Vassilyev (b. 1707–c.1782), a peasant from Shuya, Russia. In 27 confinements she gave birth to 16 pairs of twins, seven sets of triplets and four sets of quadruplets. See Guinness World Records, Most prolific mother ever. Citing this fact can only encourage those who add anyone into a family who happens to have parents of the same name and is born in the same hemisphere. However, it must also be noted that independent verification of the number of births is in dispute. See Wikipedia: Feodor Vassilyev. Lest those who are counting the number of children and are doubting also be encouraged. The number of children shown is not nearly as important as the details about where those children were born. A mother with 69 children (or any other more reasonable number) probably was not going to move around a lot. Are all the children born at or very near the same geographic location? Do the birthdates and spacing between births reflect actual physical possibilities? Are there any gaps in the birth of children for over three or four years that are unexplained? Is the number of children reasonable given the age of the mother and the father? Are there other families in the same general area with parents of the same name? These and similar question almost always lead to more research on the family. It is also very common to find that some of the children are not part of the family. The number of children listed is not usually viewed as a disconcerting factor. Mortality is one thing we all share as human beings. But genealogists are more aware of birth, marriage, and death than most of those around us who do not spend their time looking for records. Unfortunately, some genealogists seem oblivious to the realities of our mortal existence and seem to assume that the age at which people die is negotiable. Here is an example. This notice from the FamilySearch.org Family Tree is not all that uncommon. Of course, there are other such notifications such as death dates before birth and all that, but this one is the most interesting. One of the most commonly found omissions in the Family Tree is a missing death date. But can we assume a 120 year limit to human existence? If Bolivia's public records are correct, Carmelo Flores Laura is the oldest living person ever documented. They say he turned 123 a month ago. The native Aymara lives in a straw-roofed dirt-floor hut in an isolated hamlet near Lake Titicaca at 13,100 feet, is illiterate, speaks no Spanish and has no teeth. He walks without a cane and doesn't wear glasses. And though he speaks Aymara with a firm voice, one must talk into his ear to be heard. What is more important to genealogists is using a little bit of historical sense when entering data into our family trees. One phrase that has been bantered around for years is "Do the Math." This means we need to look at the dates and time periods that we enter for our ancestors and relatives that are imposed by the reality of living on the earth. Babies cannot be born before their parents or born a long period after they die. Some of the other dates are negotiable but any dates that seem well outside of the normal time frame need to be carefully verified and documented. There are a number of sources online for mortality tables. 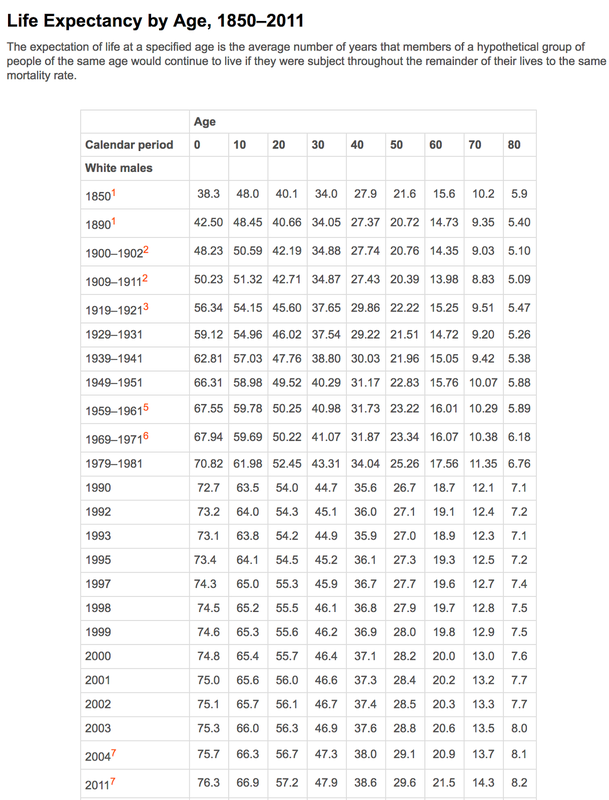 These tables give the average life expectancy for any given time period in the present or past. 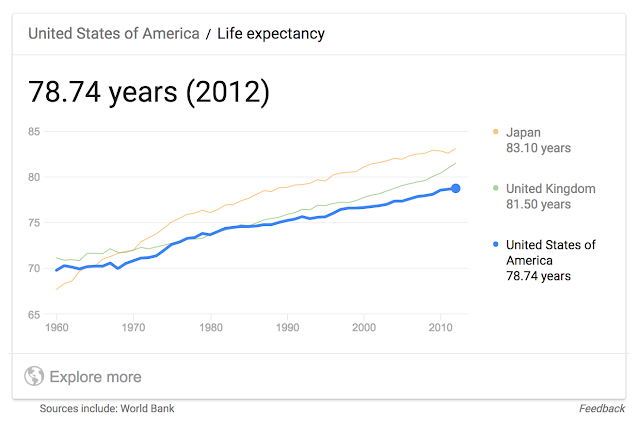 One interesting thing about the tables is that life expectancy increases dramatically if a child lives to be 5 or 10 years of age. Infant mortality was much higher in antiquity than it is now and it is not usual to see families with a number of children who died at a very young age. Here is one example of such a life expectancy table beginning in 1850. Estimates in older times are mostly conjecture because of a lack of adequate records. As with any broad brush statistical analysis, there are always exceptions. We do have accounts, such as those in the Bible, of people who lived an extraordinarily long time. But it clear that except for some notable exceptions, most of us will succumb well before we live a hundred years. Oh, by the way, you might want to read the Wikipedia article about Carmelo Flores Laura. He was also not as old as claimed. A disturbing event occurred this week when hundreds of old, previously deleted files started appearing in my Dropbox.com folder. Fortunately, I removed them from the folder before the contents exceeded my capacity. Some of the files dated back to 2011 and some even before that. 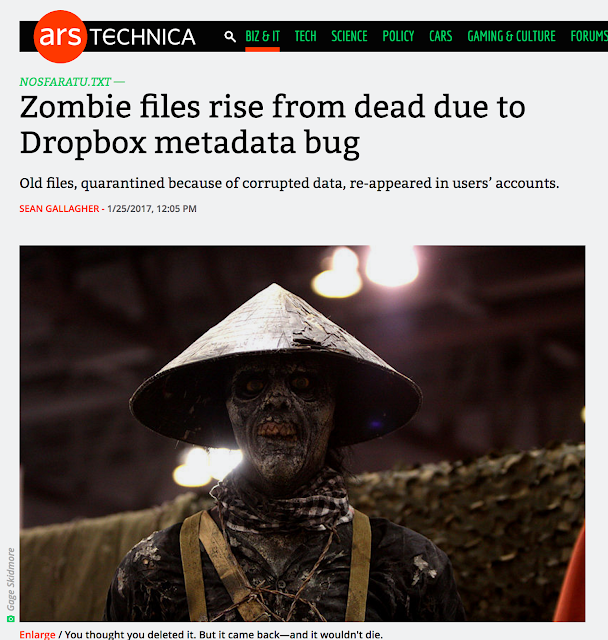 I was fairly busy and put off examining the files when notices started appearing in the news stream about the restoration of the files and attributing it to a "bug." For Dropbox.com it could have been a very "convenient" bug had a number of the people faced with the problem been told to pay for more storage. After carefully checking to make sure I was not going to delete any valuable files, the duplicates all went in the trash. There are hundreds, if not thousands, of public and private historical societies and museums around the world at local, regional and national levels. Genealogists generally seem to be unaware that genealogy is really history and much of that history is preserved by these organizations. I remember one trip I took a while ago when I visited the Hancock County Historical Society in Carthage, Illinois. 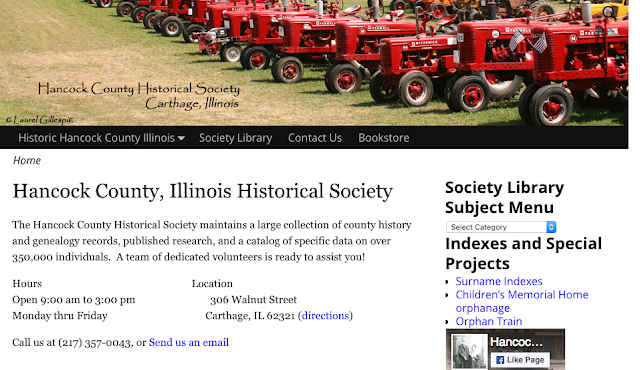 Some of my ancestors were residents of Hancock County and I was interested to find out that the Historical Society had a catalog card index of every person who had lived in the county. 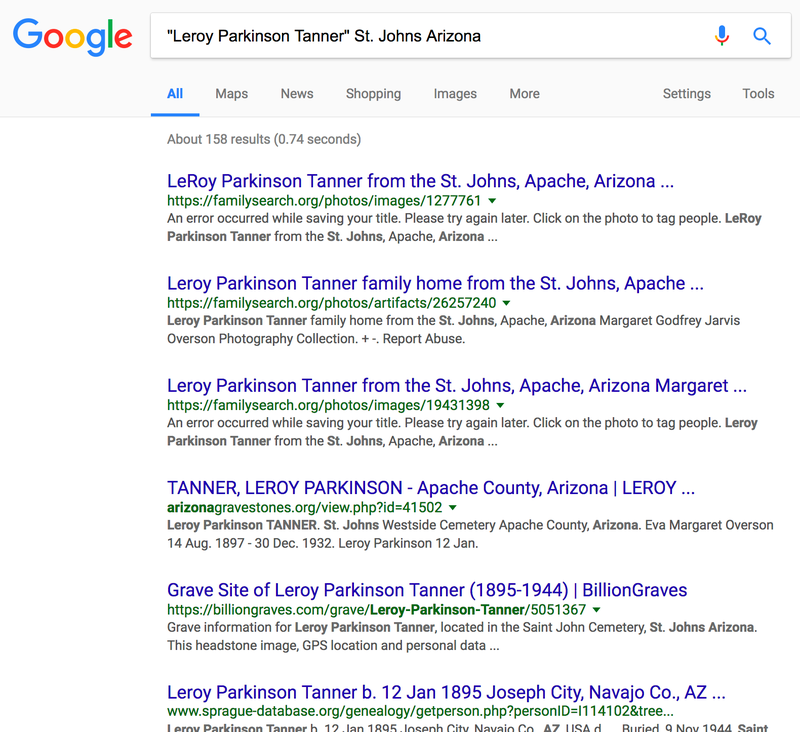 I immediately began looking at the Tanner family names and was surprised to find a huge section of cards of Tanners from Switzerland. I was vaguely aware that the Tanner surname was common in both England and Switzerland but this huge sections of cards showed me the reality of the Switzerland heritage of some of the Tanners in the United States. By the way, as far as I know, that card catalog is still there in the Historical Society and is still not digitized or online. To get started on this topic, here is a list of the lists of some of the world's historical societies along with a few museums. This is a topic I come back to every once and while because it is of overriding importance to the dedicated genealogist who wishes to resolve some of the most difficult ancestral relationships. 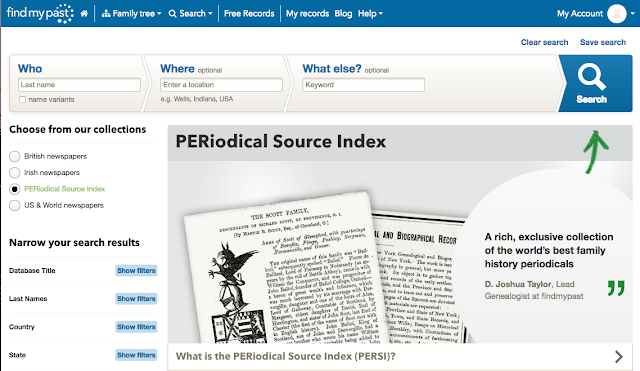 One window into the world of historical societies is the PERSI or Periodical Source index now found on the Findmypast.com website. The PERiodical Source Index (PERSI) enables you to easily locate key information about people and places. It contains over 2.5 million entries from thousands of historical, genealogical and ethnic publications, making it an invaluable, comprehensive family history resource. Most of PERSI’s articles are from periodicals covering the United States and Canada, but you can also find thousands of genealogy and local history entries (in both English and French) from Britain, Ireland and Australia. Articles fall under twenty-two different subject headings, or record types. These include biography, cemeteries, census records, church records, court records, deeds, institutions, land records, maps, military records, naturalization records, obituaries, passenger lists, probate records, school records, tax records, vital records, voter records, and wills. Article about three or fewer specific families are arranged by surname. Many of these publications are associated with historical societies and museums. Of course, some of them may not be active or even in existence, but the PERSI list can lead you to associations that may not have an online presence. You may have forgotten, but I have not. 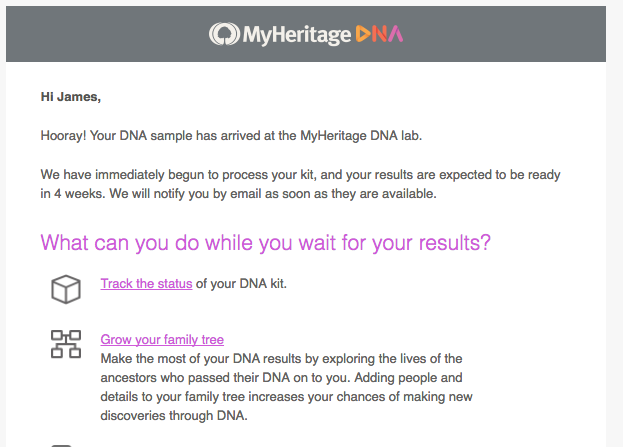 I am still anticipating the return of the MyHeritage.com DNA test that I sent in recently. I did get the above email notice on the date of this post. I did look at the tracking website and saw where the kit had been received. The time estimate is four to six weeks, so I still have quite a wait. I will keep everyone advised of any progress. Alert! 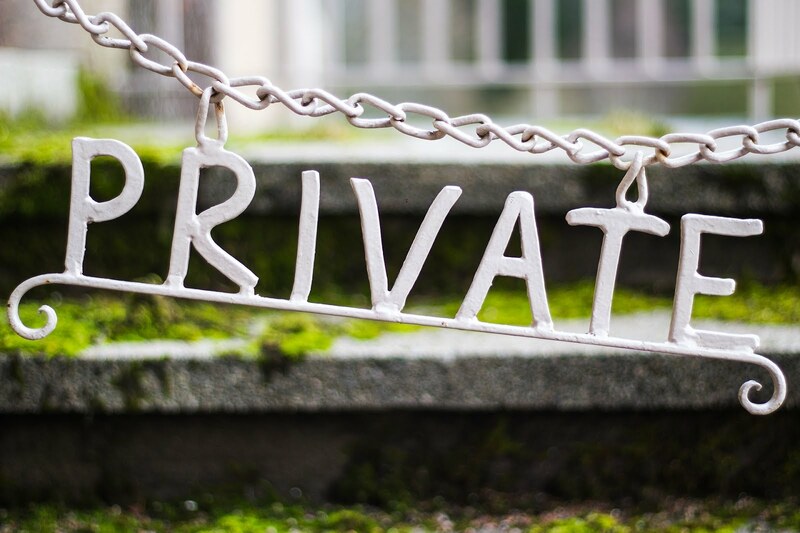 Is Your Private Information Online? The genealogical community was recently bombarded by an email solicitation to join a "new" online family tree program. The request got a lot of coverage on Facebook and other social media outlets as well as national news coverage. The come-on for the advertisement was that the program already had your information, including a lot of information some genealogists might consider to be "private." I got some frantic inquiries regarding the "private information" on the website. Here is a screenshot of a news post by a TV station about the website. This is a classic example of trying to close the barn door after the horses have already escaped. 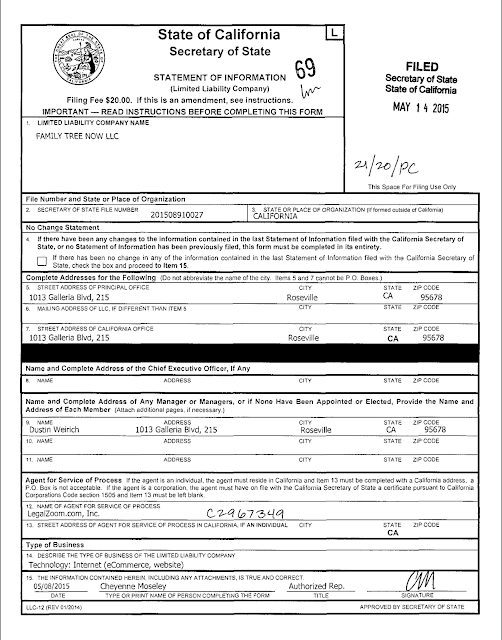 The "scary amount of personal address and family information" on the website is nothing more or less than what has been available for years as "public record" information in the United States. For example, here is another screenshot of a catalog listing from FamilySearch.org. These records were generated from telephone directories, property tax assessments, credit applications, and other records available to the public. The last part of the description refers to "other records available to the public." These records do, in fact, contain personal addresses and family information. Why would you believe that your home address was private? Did you check your mailbox recently? Have you never received one piece of "junk mail" in you life? Today, we got the mail and everything was junk mail except bills. We now seldom get any "real" mail. Almost all my communication comes through the internet. Yes, you read the number of records in the Public Records collection on FamilySearch.org right. There really are more than 875 million records in that one collection and the same records are on the other major genealogy website. Oh, by the way, the same type of information is available on county assessor websites, phone directory websites, directory websites and many other types of websites on the internet. Most people would be astonished to see the amount of information that is freely available concerning every last person, man, woman, and child, in the United States. If you were to write to any of these websites and "demand" that your information be removed, you would be bailing the ocean with a teaspoon. Every time you use a checking account, pay a bill, use a charge card, apply for a loan, buy anything anywhere, travel, use electricity or obtain any type of service including going into a homeless shelter, you are recorded and the information is then generally available. If you walk or drive around in a big city, you are likely being captured on a camcorder. You might also want to know that the United States does not have nearly the degree of surveillance of other countries such as England. Privacy at a "public" level is a myth and as genealogists we directly benefit from the lack of privacy by having access to a number of very useful databases. 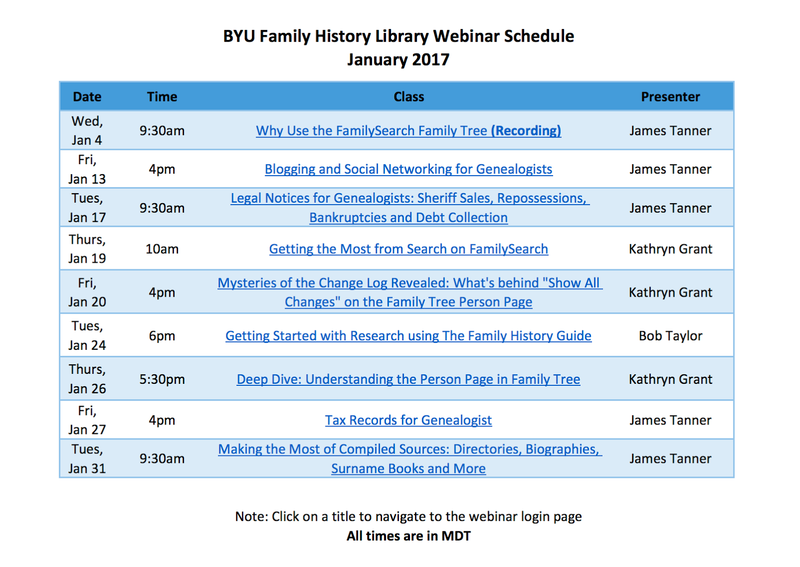 The Brigham Young University Family History Library webinar series has an updated schedule. The times are all Mountain Daylight Time. The schedule shows the times of the live broadcasts. You can go to the schedule page by clicking here. You tune into the live broadcasts from the links on the schedule. 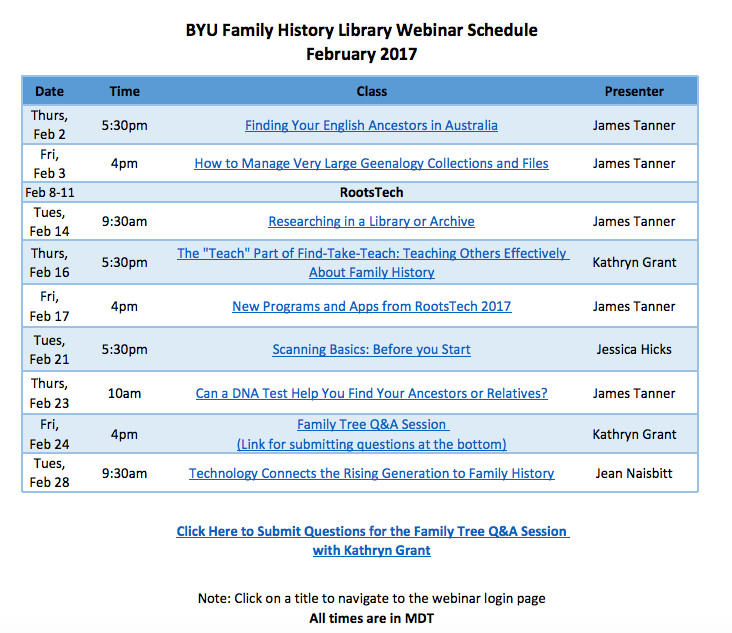 All of the webinars are recorded and are then uploaded to the BYU Family History Library YouTube Channel. In addition to the webinars, the Library will be uploading shorter training videos. If you would like to receive a notice when new videos are uploaded, be sure to subscribe to the Channel. Here is an example of a recent, very popular video. At the time of this post there are more than 230 videos and the number will continue to increase every week. If you have a suggestion for a topic please let me know by leaving a comment on this post or any other post. 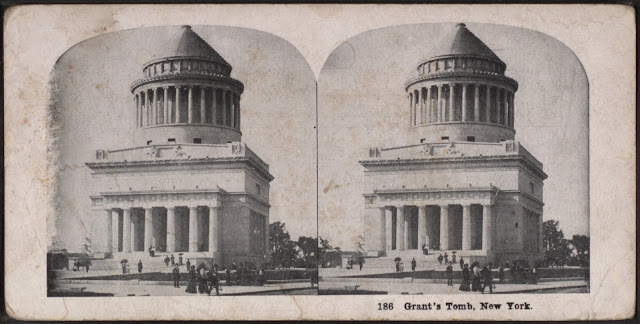 Sticklers for accuracy have noted that the bodies of Ulysses S. Grant and his wife, Julia Dent Grant, are not actually below ground in the mausoleum. Hence, strictly speaking, no one is buried in Grant’s tomb. Perhaps responses of this type may have inspired humorists to create absurdist questions. The earliest evidence of this humorous question appeared in a syndicated newspaper column by the comedian and actor Ed Wynn who often used the persona of “The Perfect Fool”. In September 1925 the column “Ed Wynn’s Question Box: He Knows All – He Sees All” printed several interrogatives with a comic edge. Of course, you know what this has to do with genealogy. You might also be interested to know that FindAGrave.com has 124 people with the name "Ulysses S. Grant." BillionGraves.com has 408 people with that name. There are also 301 people in the FamilySearch.org Family Tree with that name and 177,020 results for a search for the name on Ancestry.com. Finally, there are 1,002 people with the name that show up on Findmypast. com and many, many more in another search on Ancestry.com. You can likely see why we might have a problem with duplicate entries. So, without qualification, there are thousands of "right" answers. This also points up the danger of assuming that someone with the same name is the same person. The Heredis Genealogy program from France is the most popular software program in Europe. You really do need to take a serious look at Heredis 2017 if you are maintaining a local, computer-based genealogy program. The program is in French, German and English. If you go to the website and find it in French, you might want to translate it into English with Google Translate. Heredis 2017 has a new and unique dashboard feature. Here is a description of the new feature. There was a time when genealogists had to make an effort to find out where they had stopped in their genealogy, to find what they had done lately. Or to know which branch they were working on with their current research. Which ancestors had they already found? Which actions did they lack? Now that time is over. With the Dashboard, at a glance, genealogists know where they are: what they have already found and what they still have to do. Like a real on board computer, genealogists conduct their genealogical activities very easily. They note their progression: the genealogical and demographic statistics give them valuable indications. Detailed information enables them to analyze their file in depth and to measure the progress of their work, to check the completeness of their sources, to identify what remains to be done and to identify goals. Also, genealogists can customize this workspace by following only the indicators or widgets they have chosen. The program is extremely feature filled, but at the same time, it is easy to use. 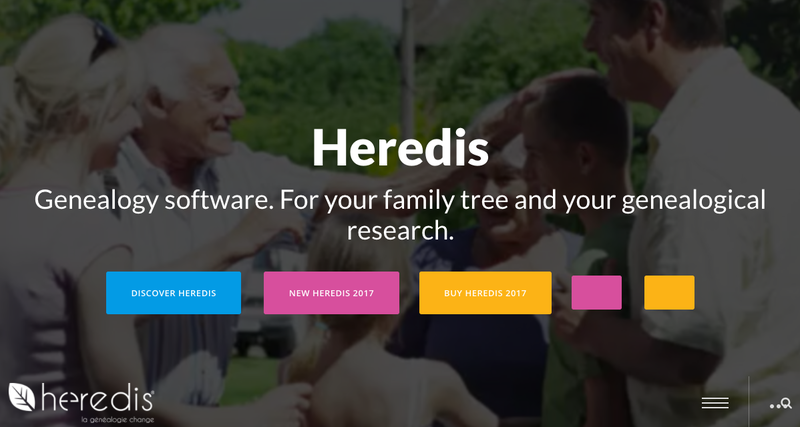 Heredis shows an extensive array of relationships on their family tree such as step, adopted and other types of relationships. 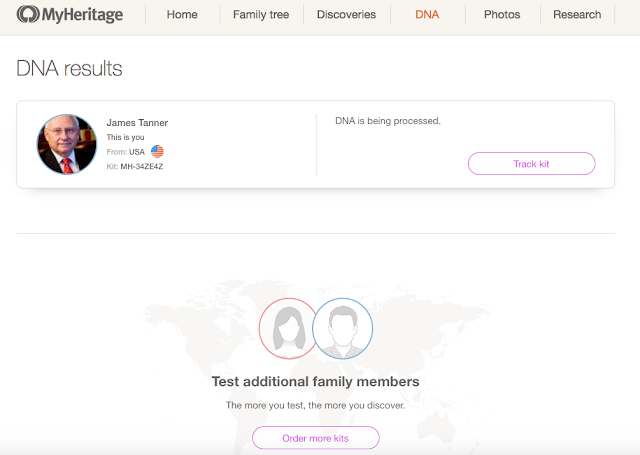 This feature makes it easy to see blended or extended families. I have to admit that the Heredis staff struggle a little with the English language in their promotional materials, but the program is entirely in English and is relatively easy to use. 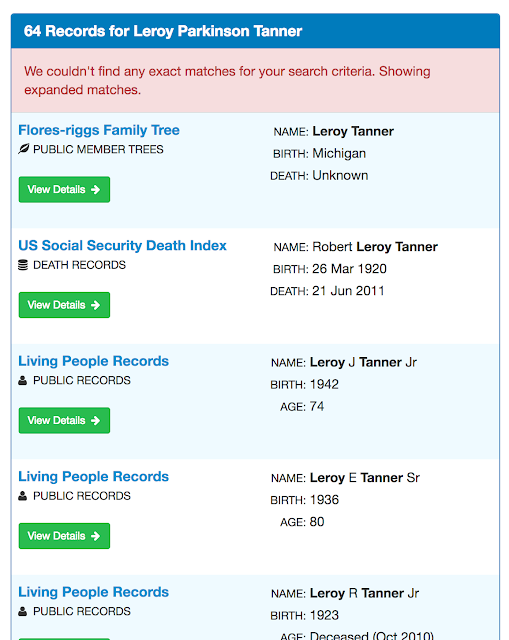 There are all the kinds of features that you could want in a genealogy database program. As an important feature, the program runs on both Windows and Mac OS operating systems as well as Android and iOS devices. It also shares its data files over all of these devices. Here are some notes on the versions, pricing, and availability. Heredis 2017 for Windows and Mac will be available on January 31, 2017 on heredis.com and the App Store. 500 MB of hard drive space Screen1024× 700 minimum 64 bits only. Mac Mavericks (10.9) to Sierra (10.12) 300 MB of hard drive space Screen1024 × 700 minimum Internet connection for searches, publications, integrated maps and dashboard. Due to the requirements of the AppStore, the Mac version does not have an update rate but a launch rate priced at US $24.99 until February 28, 2017, at 50% discount. 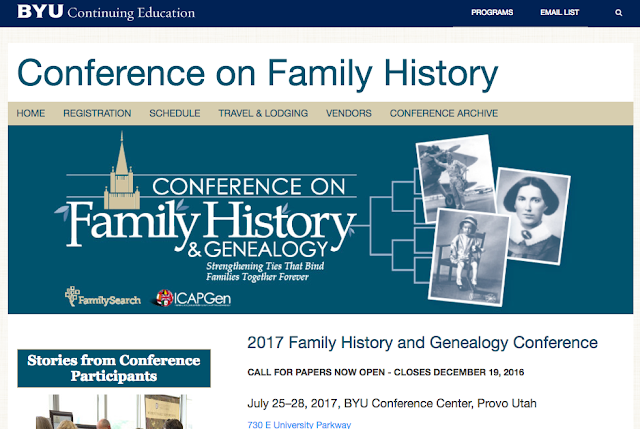 The 49th annual BYU Conference on Family History and Genealogy will offer more than 100 classes, allowing participants to gain new skills and helpful information. The Conference is held on the beautiful Brigham Young University Campus in Provo, Utah every July. This year's four-day conference is scheduled for July 25 - 28, 2017 at the BYU Conference Center, Provo, Utah. The Conference Center is presently under construction, as it was for last year's conference. I drive by the Conference Center nearly every day as go to the BYU Family History Library and have been watching the construction. I was pretty sure the construction would not be completed by July of this year. I have attended the conference in the past and enjoyed some really interesting classes. This year, I have submitted some topics to teach at the Conference, but I know there are a lot of applicants and I haven't heard yet if any of my proposals will be accepted. I live only about five minutes away from the Conference Center so it is very convenient to go to the Conference. Additionally, the BYU Family History Library is open during the event and is right there on the campus of the university and you could spend some time in the second largest family history library in the world. However, Monday, July 24th, is a Utah State holiday and the Library and the rest of the University are closed. July 24th is Pioneer Day in Utah when the Mormon Pioneers entered the Salt Lake Valley. 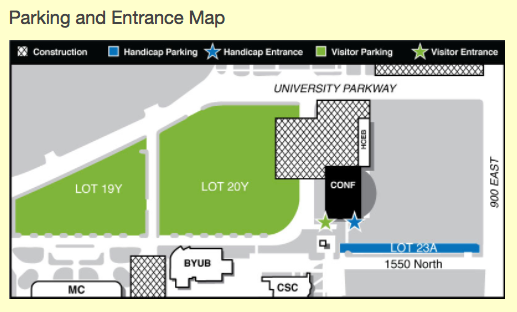 However, during the days of the Conference, if you would like a tour of the BYU Family History Library and maybe some help with research, I can probably schedule some appointments in the evenings after the conference, assuming the Library is open. We are on the academic calendar and classes are scheduled during the conference so the rest of the school will be open and running as usual. The weather in Provo is warm and sunny but there can be rain. Provo is about 45 miles south of Salt Lake City and there are quite a few hotels and dozens of restaurants near the campus. Provo is not particularly a walking city so you would likely need a car to get around. Provo is right next to some very high mountains and the altitude of the city varies from about 4500 feet above sea level to over 5000 feet above sea level. 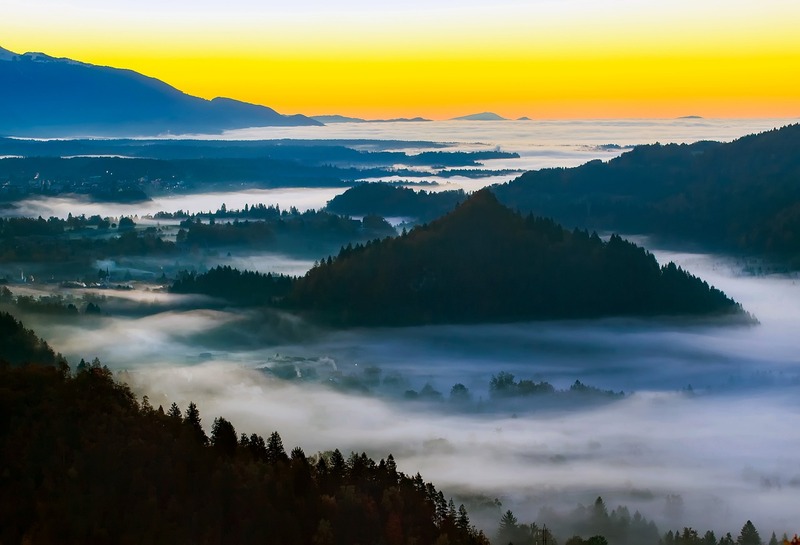 If you are not used to the altitude, you need to be aware that you might get more tired than usual walking around. I have been reviewing some of the online pedigrees for my remote ancestors and I commonly see people added either without any source citations or where the locations cited do not match the places where the family lived. When we are confronted with a unified family tree program, such as the FamilySearch.org Family Tree where all of the registered users have access to edit and add content, we need to be extremely careful to examine the sources and conclusions derived from those sources. 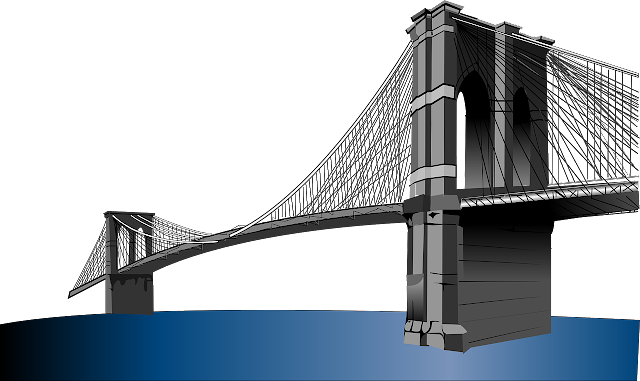 Most of the errors I find in these online family trees are like trying to build a bridge in the air. 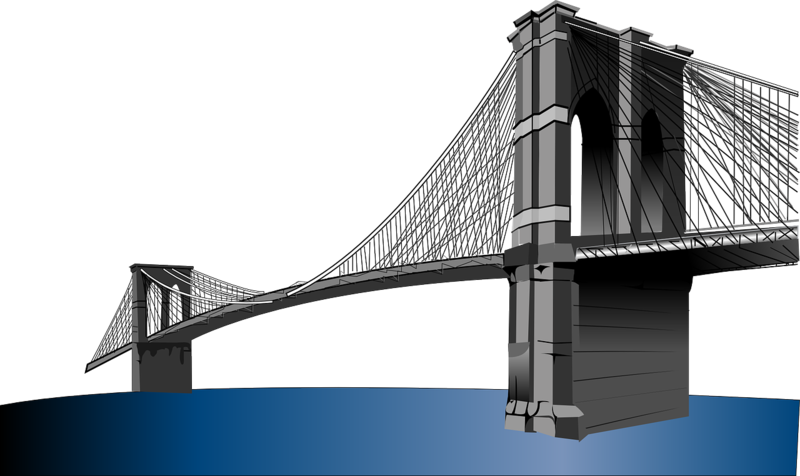 You need to start with a firm foundation before you start building the bridge out in the middle of the stream. Here is a quote from the FamilySearch.org Family Tree about one of my ancestors. This information recently came to light--mostly from *** (name of person deleted), and then using my brain and promptings to 'organize' that information into the families as they really were. This is what was provided rather than a source citation to any historical record. I really don't know how to respond to genealogy by "brain and promptings." I am certainly not discounting the importance of inspiration or insights, but they both usually come after a lot of hard work and research. In this particular case, no one has apparently reviewed even the records that are easily obtained and available. From my personal standpoint, I am still documenting this line starting with the previous or more recent generations. What is interesting about this comment is that the comment relates to a person who is not yet well documented from existing sources. I would certainly agree that genealogy would be a lot easier if all I had to do was think about the families and not have to be bothered with all that messy and pesky documentation, but unfortunately, I am stuck with having done too many years of research to simply dump it all in the trash in exchange for good feelings and my "brain." Genealogy should be source-centric. Every date and place should be supported by an evaluated and pertinent source document or record. As I have written many time before, unsupported entries in the FamilySearch.org Family Tree or any other compilation of genealogical data that is unsupported by valid sources is mere speculation. England got a double dose of Latin-speaking (i.e. now called Romance Languages) conquerors. First, in ancient times, the Romans invaded the British Islands and ruled from 43 A.D. to 410 A.D. Then in 1066, William the Conqueror came with his Norman-French army. In addition, because of the influence of the Catholic Church, Latin was commonly used in both church and legal proceedings. In the United States, copying Europe, a classically educated person was supposed to be fluent in both speaking and writing Latin. Of course, since there are no recordings of people who lived before recording machines were invented, we have only a very sketchy understanding of how Latin, more particularly, ancient Latin sounded when spoken. We can make very educated guesses, but we cannot know for sure. So, because of the preeminence of Latin in both the ancient liturgical and legal communities, we are still burdened by a large number of Latin phrases even up to the present day. As I have written previously, some of these Latin words and phrases have become so common, they have passed into the English language and are used as regular English words. Genealogists run into Latin in legal documents of all kinds including, but not limited to, court records, land and property records, contracts and many other types of records. Fortunately, when a genealogist today encounters a Latin term, the researcher can use a quick Google search to give the meaning and the context of the term. So, why am I writing these blog posts about Latin terms? Good question. Since I speak Spanish fluently and have had a long exposure to legal terms, I suppose I just might be able to give some insight into the practical, as opposed to the "dictionary" meaning of some of the more commonly heard terms. pro bono publico literally, "for the common good"
This phrase is usually shortened to "pro bono." At the present time, the word is applied to the practice of doing work for the good of the public and with a total disregard for compensation or credit. In most places in the United States, attorneys are encouraged to provide a certain number of hours of work for free each year under the guise of working pro bono. However, most of us did a lot more work for free than we planned to or expected to do. When the phrase is used as "pro bono publico" it usually refers to some kind of charitable work. prima facie literally, "at first face" of better yet "at first look"
This is another term that has passed into the English language but it does have a fairly complex meaning in English. It is often used when something is obvious or self-evident. But it is also used in a technical sense in court to refer to the fact that the evidence in a lawsuit has to exceed some minimal level of proof before the case is deemed at issue, as in the following: the attorney failed to make a prima facia case for his client and the matter was dismissed by the court. post mortem literally, "after death"
This is yet another phrase that has passed into English. It refers to the actions of a coroner or any one else who performs services for the deceased after death. The phrase has become common in television shows about special police criminal investigation units. posse comitatus literally, "power of the county" or more generally, "power of the community"
This phrase was appropriated by a far-right political group in the 1960s. It is commonly defined as the common-law or statutory law authority of a county sheriff, or other law enforcement officer, to conscript any able-bodied man to assist him in keeping the peace or to pursue and arrest a felon, similar to the concept of the "hue and cry." The phrase originally appeared in the English common law. See Wikipedia: Posse comitatus. It is commonly shortened to "posse" and overused in old western movies. It has been partially outlawed in the United States. persona non grata literally, "unwelcome person"
Some of these phrases have become so common that they have not only become English words but also have become used so frequently that they have, in essence, a single word. In this case, just as with the previous phrase, movies and TV converted this word into a household term and uprooted it from its classical Latin beginnings. Although I have heard this word in a lot of other contexts, I cannot remember ever hearing the phrase used in court or in a legal pleading. per stirpes literally, "by branch"
A method of distributing an estate to the descendants of a deceased legatee in which the estate is divided equally among the branches of a family, without regard to differing numbers of people in different branches. Wikipedia: Per stirpes. Well, that is about as simple as you can get with methods of distribution in an estate. The practical reality of this type of distribution is that, for example, each child of the deceased takes the same amount regardless of how many children they have. per se literally, "by itself"
This is one of two of the Latin phrases I use more than any other. It has a multitude of uses and I usually use it for the English phrase, "without more" or in the words of Porky Pig, "That's all folks." per quod literally, "by which" or "whereby"
The English translation has no real meaning but the Latin implies an entire legal issue. Quoting from the Wikipedia article entitled, "Per quod"
Per quod is a Latin phrase (meaning whereby) used to illustrate that the existence of a thing or an idea is on the basis of external circumstances not explicitly known or stated. "Statements are considered defamatory per quod if the defamatory character of the statement is not apparent on its face, and extrinsic facts are required to explain its defamatory meaning." Kolegas v. Heftel Broadcasting Corp., 607 N.E.2d 201, 206 (Ill. 1992). With defamation per quod, the plaintiff has to prove actual monetary and general damages, as compared to defamation per se where the special damages are presumed. A quick search on Google Scholar showed 3,480 United States' legal cases that used the phrase. per proxima amici literally, "by the next friend"
This phrase addresses the issue of when a minor child cannot maintain an action pro per, then the court must appoint an adult to act "pro proxima amici." In English the person appointed by the Court is often referred to as the "next friend" of the court. per curiam literally, "through the court. "In the United States, this term usually refers to decisions made by the U.S. Court of Appeals or the U.S. Supreme Court where the decision of the court fails to list the judges from a multijudge panel who did not support the decision. Well, time to stop again. 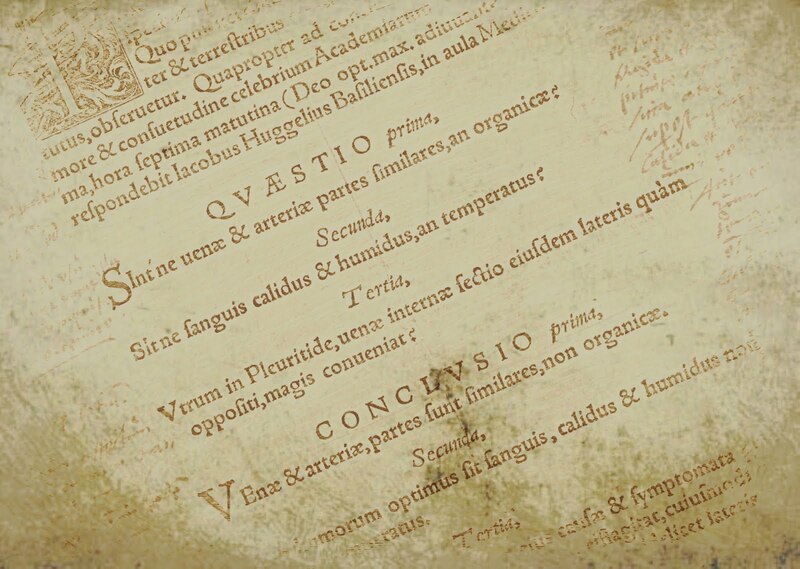 Who knows when the urge to dive into some Latin phrases will strike me again? Here are the previous posts in this series. It is fairly common among those searching out their family history to find someone who was jailed for some reason or another. To some, this may seem to be something shameful to be ignored or even edited out of the family's history, but to other researchers, everything that happens to our ancestors creates the potential for valuable historical records. In researching my own family, I have found a few instances of ancestors who were accused and convicted of criminal laws. I found one ancestor who appeared in the U.S. Federal Census in a California prison. In another instance, our family tradition was that a certain ancestor had never been arrested or convicted even though the tradition was clear that he had violated the law. Through research in local newspapers of the time, I was able to find an account of his conviction, although he did not have to go to jail. Today's media is almost saturated with depictions of crimes and criminals. Unfortunately, very few of these shows come even close to representing the reality of the criminal justice system either in the present or in the past. Most of the dramatic depictions either focus on criminal trials or incarceration. In my own experience, when I was representing criminal defendants as a court-appointed attorney, criminal trials are just about as boring and ordinary as any other type of court proceeding. In the United States for the last 50 years or so, only a very small percentage of criminal convictions are entered as a result of a trial. Almost uniformly the vast majority of criminals in the United States plead guilty as a result of some plea agreement. Criminal law is statutory law. This means that crimes are defined by the laws passed by the legislature or other ruling entity and are distinct from civil laws by the penalties imposed: fines, forfeitures or incarceration. 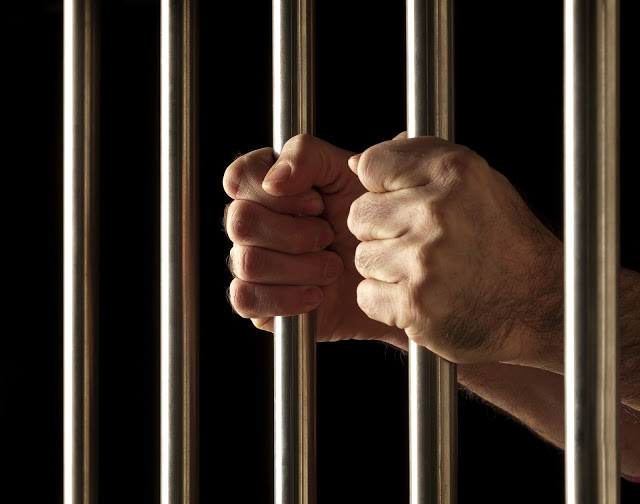 Although there are civil fines, criminal laws usually have incarceration either as an addition to a monetary fine or instead of a monetary fine. 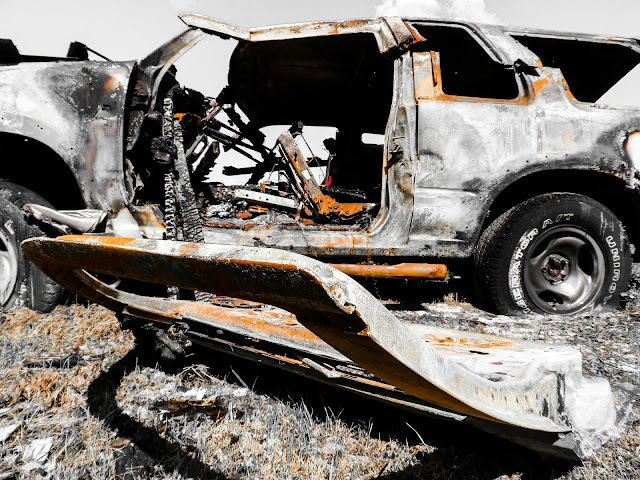 In the more distant past, criminal laws are sometimes depicted as harsh and unreasonable, but with any historical research, it is important to view events in the context of the time when they occurred. From our present viewpoint, the penalties and treatment of criminal prisoners may seem harsh and very unfair, but in the early 1800s and before, individuals had very few rights to which we now believe everyone is entitled. If we wrongfully assume that the conditions that exist today are the same as existed in the past, we will often miss important historical information. For example, we may dwell on the hardships suffered by our ancestors because of their primitive living conditions, but in doing this, we fail to realize that everyone lived under those same conditions. When we go camping we may have to give up a few modern conveniences such as hot and cold running water and indoor plumbing, but most of our ancestors lived with those "primitive conditions" all of the time. When we see movies or read about the deplorable conditions suffered by prisoners in the distant past, we need to have some perspective about how the rest of the population was living. This is a really sketchy outline. Depending on the severity and publicity of the crime, these proceeding can get really complicated. But again, in the vast majority of the cases in the United States, if the defendant pleads guilty, the case moves on to the sentencing phase and the case is essentially over. In future posts, I plan to discuss the documents that genealogists might use from actual court records. 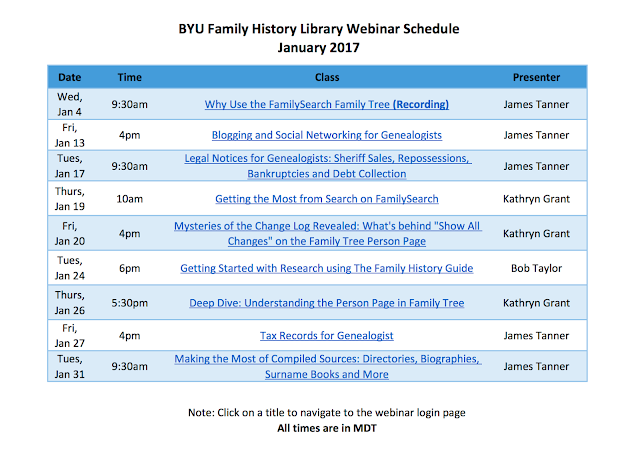 The Brigham Young University Family History Library started off the month of January 2017 with a webinar about the FamilySearch.org Family Tree and another webinar about blogging. Here is the schedule for the rest of the month. During the coming year, we plan to host about this number of webinars each month and also upload shorted training videos. If you have any suggestions for topics we would be glad to consider them for production. Remember to subscribe to the BYU Family History Library YouTube Channel for notice of the new videos. 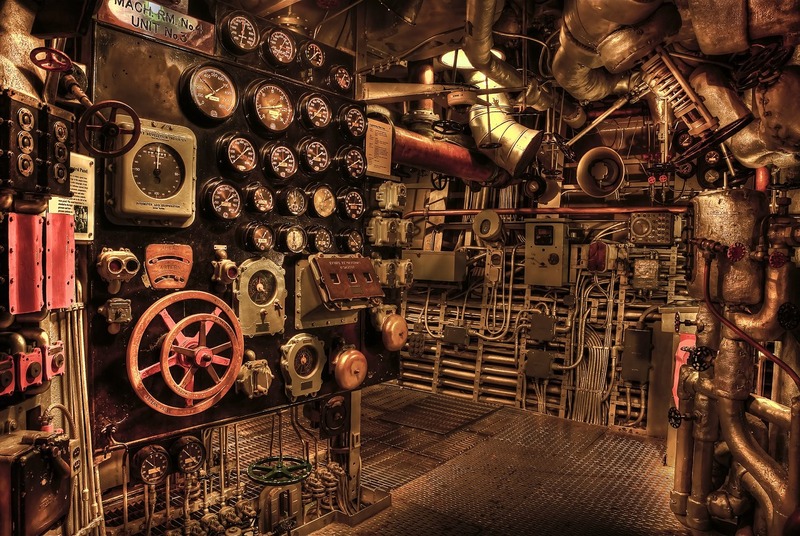 One overriding issue with using computers and the internet as tools in all my genealogical activities is that they become necessary and I become dependent on having computers that work and a connection to the internet that works. In the past while, we have had significant challenges both in maintaining an internet connection and in keeping our computers operating. Yesterday, since we are on our way to a conference in Yuma, Arizona this week, I began getting our MacBook Pro laptop up and ready to go. I have been having problems with the computer so, I thought it would be a good idea to see how it was operating. After more than thirty years of working with computers, I usually begin to see things that make me think they are going to die. I became so concerned, that we went out and purchased a new Apple MacBook Air. Now, I know that Apple is likely abandoning that particular model, but the current model is a huge upgrade from my very old MacBook Pro and the new computer was on sale, which hardly ever happens with Apple products. Just in case you are wondering, it was a new computer right out of the box. When we got home with the new computer, I found that the old MacBook was in the last throes of dying. The new computer arrived just in time. Over the past year, I have been using an iPad Pro as a laptop substitute. I have found that the iPad Pro is a good substitute for about 90% of the things that I do on a computer, but that the remaining 10% is very difficult. The main issue for me is the ability to integrate images and text by importing images, particularly screenshots, into my presentations and blog posts. This can be done, but the process is relatively painful. Since I am confronted with a series of conferences and presentations in the next few months, I could not afford the extra time it takes to work on the iPad Pro. Don't get me wrong, I really like the iPad Pro and use it all the time especially for presentations, but I have not been able to use it as much for creating those same presentations. This experience should be a cautionary tale for all of those genealogists out there who are using computers. The computers are machines and machines, even very advanced and sophisticated ones, eventually get out-of-date and die. They may seem to be immortal, like my old, banged up, MacBook Pro, but they will eventually need to be replaced. I do not keep any irreplaceable data on either my iPad Pro or my MacBook Pro and likewise, I will not keep any such data on my new MacBook Air. While working in libraries and helping people with their genealogy, I am faced with a constant stream of people with old, out-of-date computers, operating systems and programs. In many cases, they are trying to transfer the old data to a newer computer or online. But what I do not hear about as frequently is the constant loss of information due to computer and storage device crashes (or in the case of flash drives; lost drives). What many genealogists do not factor in when they weigh the cost of upgrading a program, buying a new or larger hard drive, or replacing a computer is the cost in time of redoing all the lost work. When I got home with the new Apple MacBook Air, I decided to work with the old laptop. We actually have a need for another computer since now both my wife and I are presenting at some of the conferences. The next problem was that I had forgotten my password for my laptop. It had a hint, but even the hint did not help me remember. Finally, my wife suggested a really old password and that turned out to be the right one. So even if we keep our equipment up-to-date, we still need to remember our logins and passwords to keep working. Life with computers is interesting and sometimes very challenging. [Planta, J. ], A Catalogue of the Manuscripts in the Cottonian Library, Deposited in the British Museum (London, 1802), p. 220. Tite, Colin, The Early Records of Sir Robert Cotton's Library: Formation, Cataloguing, Use (London: British Library, 2003), pp. 605-06. Other than being written primarily in Latin and in an ancient script, their availability, their lack of reliability and lack of any indexing, there is not too much preventing genealogists from using ancient manuscripts to extend their genealogy back into the Dark Ages. However, by examining online family trees, you might get the impression that the current genealogical community was brimming over with medieval specialists. Just in case you wake up in the middle of the night and have an insatiable urge to delve into this highly specialized area of genealogical research, I thought I would provide a sampling of where you might find some online offerings. It might take you a while, but you can find a huge number of medieval manuscripts on the Europeana.eu website. 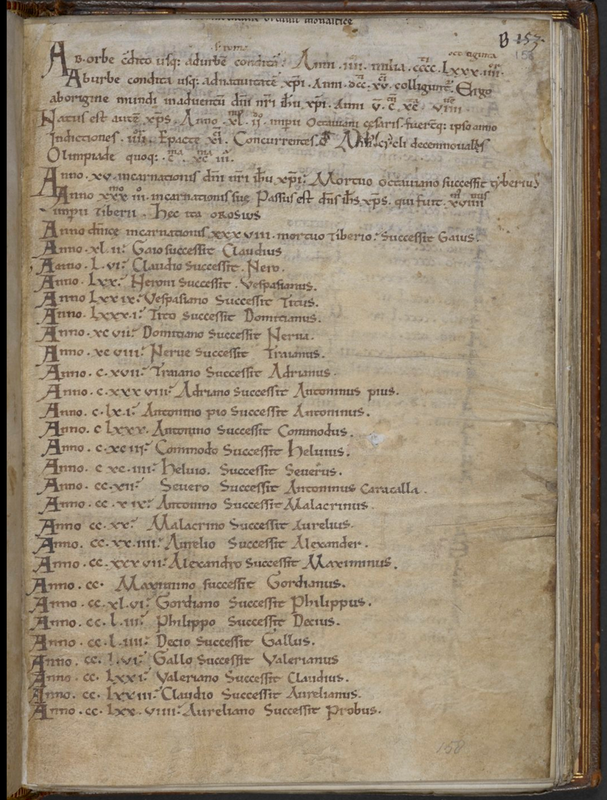 This website has over 250,000 images and over 22,000 texts related to medieval documents. Almost all of these, unlike some other online sources, are available for re-use. You will be amazed at the quality of the images and your ability to enlarge and view the images. Here is a sample page. 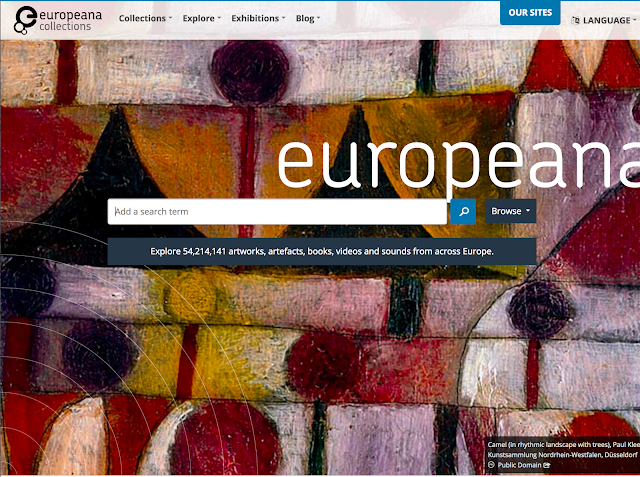 Most of the museums and larger libraries of Europe participate in providing content to Europeana.eu and the website presently has 54,214,141 artworks, artifacts, books, videos and sounds from across Europe. Some of the countries of Europe are very protective of their collections and subsequently, they limit their online availability and utility. Great Britain claims a Crown Copyright, for example, that applies to a work is made by Her Majesty or by an officer or servant of the Crown in the course of his duties". The Crown can also have copyrights assigned to it. There is, in addition, a small class of materials where the Crown claims the right to control reproduction outside normal copyright law due to Letters Patent issued under the royal prerogative. This material includes the King James Bible and the Book of Common Prayer. See Wikipedia: Crown Copyright. Unfortunately, many items kept in the British Library are restricted even where Crown Copyright does not apply. By the way, Great Britain is not at all alone in this practice, many institutions in the United States and elsewhere restrict access to old or even ancient documents for all sorts of reasons, none of which involve enforceable copyright claims. Harvard College Library, Digital Medieval Manuscripts at Houghton Library. If you want a sample of the types of restrictions placed on the collections see Houghton Library Reproductions and Permissions. 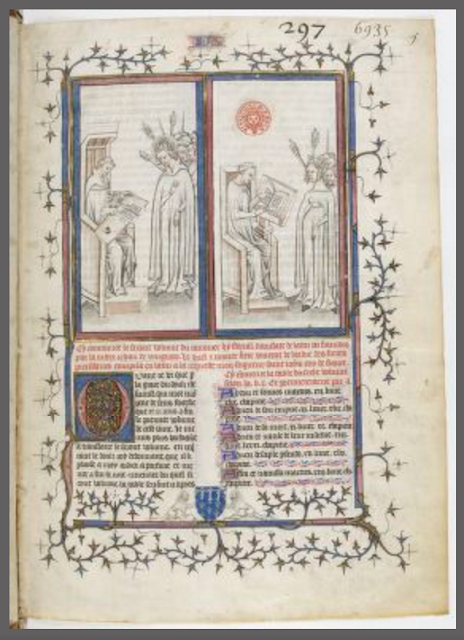 Siân Echard, Department of English, University of British Columbia, Medieval Manuscripts on the Web. This is a good list of sources. 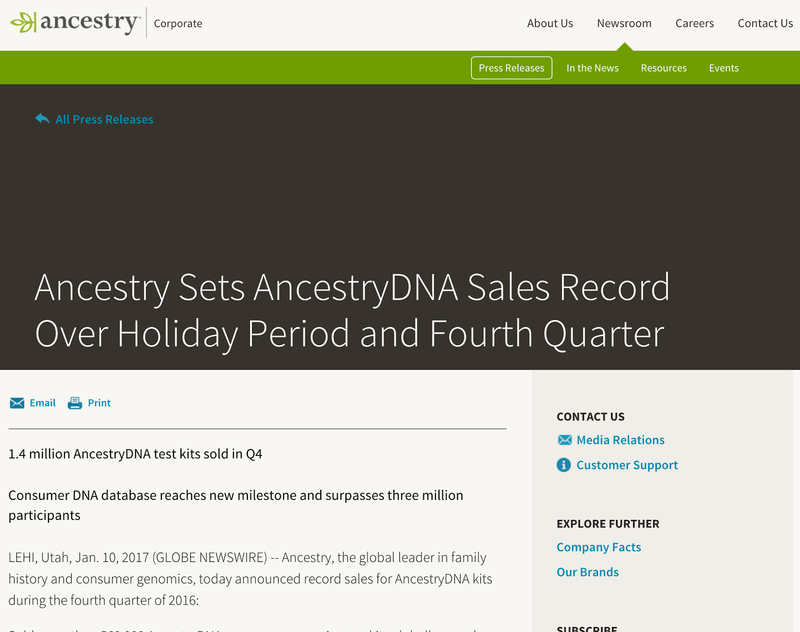 The company also announced that AncestryDNA has reached a new milestone as its consumer DNA platform became the first to exceed three million participants, further establishing the company as the leader in the rapidly growing consumer genomics industry. AncestryDNA is owned and operated by Ancestry.com DNA, LLC, a subsidiary of Ancestry.com, LLC. 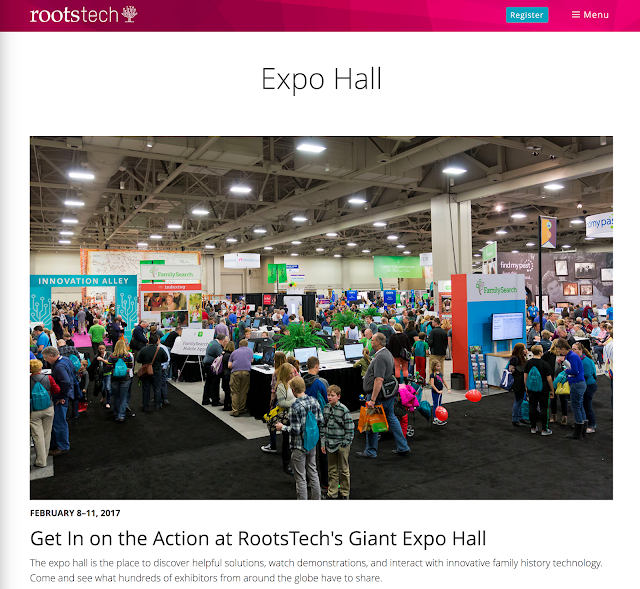 While most of the people who attend RootsTech 2017 will attend classes don't forget to spend some time in the Expo Hall with the exhibitors. Many of the exhibitors have booths where they teach about their products and programs. Not all of these are commercial enterprises. There are usually quite a few of the exhibitors that have a place where they teach classes and provide support for their products. In addition, there is the Demo theater where you can sit and rest while different presenters give 15-minute presentations and demonstrations. This year, I have opted to do all my presentations in the Expo Hall. So far, I will be doing presentations for The Family History Guide and MyHeritage.com. As we get closer to the Conference, I will post my own presentation schedule. RootsTech 2017 has apparently not yet published a list of the exhibitors, but once that list is made available, perhaps in the program handed out when you register, you should review the list to make sure you visit the booths of the exhibitors you would like to contact. But also remember that the Conference gives you a valuable opportunity to learn about new products and services you may not now know about. You should also be ready with some kind of business card. Many of exhibitors have drawings and giveaways and collect entrants' business cards or have the entrants fill out a paper. Some attendees print off pages of labels with their contact information to avoid the need to stand there and fill out a card or paper. Some just bring a stack of pre-printed cards. Some of the exhibitors have shopping bags as giveaways. The attendees can then use these bags to collect information and giveaways from the other exhibitors. My wife then uses these same bags when she buys groceries instead of using the stores' plastic or paper bags. There are food vendors in the Expo Hall, but bear in mind that the lines can be long. Last year, it turned out that several of the food vendors were tucked away from the main part of the Expo Floor and if you find a long line for lunch, you might want to check to see if there are other vendors whose lines are not so long. Of course, you can fill up on soda pop and candy if that is all you want to eat. In past years, I have tried using a wheeled pull-tote or rolling suitcase or briefcase. All of these are a real bother and hazard when moving through crowds. It is much easier to bring a backpack or over-the-shoulder bag to carry items than try to maneuver through the crowds with a wheeled pull device. I carry a backpack with my computer and other things I need. I have a coat that stuffs into a compact bag and that helps to avoid having that extra item to carry around in my hands. The Salt Palace is really big and you will find that outside of the Expo Hall places to sit are at a premium. In some cases, you can find a seat in the large presentation halls between classes or at other times. During the first couple of years of RootsTech, there was considerable congestion in the elevators. Now that the Conference has spread out over more of the Salt Palace, the congestion is not so bad but you still have to keep moving to get a seat in some of the classes. If you are driving to the Conference, you need to plan ahead for parking. This year we are going to take the Trax light rail downtown and avoid the parking problem altogether. We will park at one of the Trax stations and then ride downtown to the Conference sessions. Remember that there are some events that go on late into the evenings and your parking may expire before the event is over (speaking from experience). We have been having some cold and very snowy weather lately and you might want to be prepared. What is the best buy right now in data storage? How much does it cost to practice genealogy?